2018 KTM 690 Duke. Picture credits - KTM. Submit more pictures. Two decades ago, the original Duke was nothing short of revolutionary. KTM�s first single-cylinder street bike grew into a cult classic, adding extreme fun to a raw and radical concept. Today�s 690 DUKE stays faithful to its ancestor�s ways, but adds future-proof refinements: impressive smoothness, sophisticated electronics, improved ergonomics and tons of grunt. Driveline: 5/8 �x �1/4 X Ring. Primary drive: 36:79. Front brakes: Single disc. ABS. Brembo. Floating disc. Four-piston calipers. Radially mounted. Rear brakes: Single disc. ABS. Brembo. Floating disc. Single-piston caliper. Ask questions Join the 18 KTM 690 Duke discussion group or the general KTM discussion group. Get a list of related motorbikes before you buy this KTM. Inspect technical data. Look at photos. Read the riders' comments at the bike's discussion group. And check out the bike's reliability, repair costs, etc. 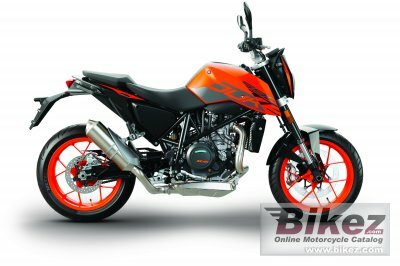 Show any 2018 KTM 690 Duke for sale on our Bikez.biz Motorcycle Classifieds. You can also sign up for e-mail notification when such bikes are advertised in the future. And advertise your old MC for sale. Our efficient ads are free. You are also welcome to read and submit motorcycle reviews.